Tyler Timothy Montgomery, an American football running back for the Baltimore Ravens of the National Football League (NFL). 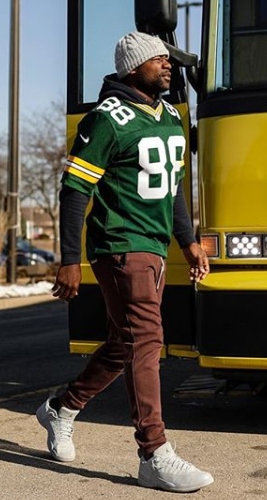 He is professionally known as Ty Montgomery. He was a five-sport star in football, track, basketball, baseball, and lacrosse in college. He was drafted by Green Bay Packers in the third round of 2015 NFL Draft. 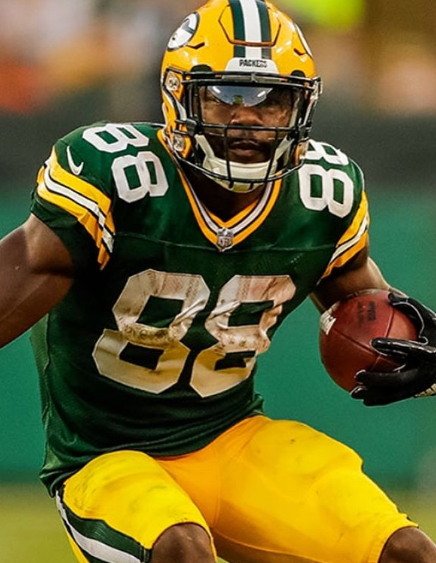 Ty Montgomery is ready to move past final days with Packers. Ty Montgomery’s birth name is Tyler Timothy Montgomery. He was born on 22 January 1993 at Jackson, Mississippi. He was born to Ty Montgomery Sr. and Lisa Frazier. When he was three, his parents got separated. He grew up staying with his mother. But his father remained active in his life. He belongs to American nationality. He was raised in Dallas, Texas. He attended St. Mark's School of Texas in Dallas, Texas. He was a five-sport star in football, track, basketball, baseball, and lacrosse. Later he attended Stanford University and continued to play football. Montgomery’s height is 1.83 m and weight is 98 kg. His other features are not mentioned. But overall, he has a balanced and healthy body. From 2011 to 2014, he played football at Stanford University. In 2011, he made 24 receptions for 350 yards and two touchdowns. In 2012, he finished the season with 26 receptions for 213 yards. In 2013, he completed with 68 receptions and 1089 receiving yards along with 10 touchdowns and 159 rushing yards and two rushing touchdowns. In 2014, he finished his senior season with 61 receptions for 604 receiving yards and three touchdowns to go along with 144 rushing yards and a rushing touchdown. In the 2015 NFL Draft, he was selected in third round by Green Bay Packers. Then on 21 May, he signed the contract with them. In 2015, he suffered from an ankle injury. Overall, he finished the rookie season with 15 receptions for 136 yards and two receiving touchdowns. In 2016, he finished the season with 457 rushing yards, three rushing touchdowns, 44 receptions, and 348 receiving yards. In 2017, he completed the season with 273 rushing yards, three rushing touchdowns, 23 receptions, 173 receiving yards, and a receiving touchdown. In 2018, the Packers lost the game with Los Angeles Rams. On October 30, 2018, Montgomery was traded to the Baltimore Ravens in exchange for a seventh-round pick in the 2020 NFL Draft. Montgomery is married. He tied the knot with Remy Klamer in Hidden Vines Chapel on 3 March 2017. The couple welcomed the first child on 13 June 2018 and named him Stone Anthony Montgomery. By the Green Bay Packers in 2015 NFL Draft he sealed the 4-year deal with the team worth $2948795. He earned a yearly salary of $716500. He also got a workout bonus of $12000 in 2018. In 2013, he was an All-American as a return man. At Stanford he played for coach David Shaw.